A new record price for a flask! What a flask it is.. the famous "Firecracker Flask". A flask that honors two of the great men in U.S. history, framers of the Constitution, former presidents of these United States. They both died on July 4, 1826, within hours of each other. Exactly 50 years from the signing of the Declaration! Can it possibly get more "historical" than that? I don't think so. Pikes Peak flasks, Civil War flasks, Success to the Railroad, Tippecanoe Cabin, all of the pictorial flasks, whew!! They are beautiful, and historical! They are out of my league... and out of my limited realm of knowledge.. and for the most part out of my pocket book capacity. We western digger/collectors just have bottles. Good old bottles! Crazy names, funny shapes, beautiful colors. I guess we have a few that have a historical theme... the beautiful Chalmer's Catawba Wine Bitters... Sutter' Mill, or the Old Pioneer Whiskey...the California Bear (can you hear the scoffs and hoots raining down from east of the Mississippi) ha, ha! Ok, we have what we have... but we do have a name on a bottle that is tied to Mr. Jefferson. His name is tied to Lewis & Clark, tied to John C. Fremont, to Charles Darwin, tied to half the western U.S. If you live in N. California, or N. Nevada how often do you say that name, as compared to John Adams, or maybe even T. Jefferson. "Alexander von Humboldt was the reigning scientific mind of the early nineteenth century, a unique combination of naturalist and adventurer. With his companion, Aime Bonpland, Humboldt cut a six thousand mile swath across the New World, through what is now Venezuela, Columbia, Ecuador, Peru, Mexico, and Cuba. Risking his life in treacherous terrain, he conducted the first extensive scientific explorations of the Andes and the Amazon, literally redrawing the map of the Americas and dramatically expanding our knowledge of the natural world. He brought back to Europe more than 60,000 plant specimens and a multitude of exotic New World animals, set an altitude record while climbing the volcano Chimborazo, made revolutionary discoveries regarding volcanoes and the Earth's magnetic field, and introduced millions of Americans and Europeans to the astonishing cultures of the Aztecs and the Incas. Alex von Humboldt, incredible traveler, author, and father figure of science, was perhaps the most admired man of the 19th century. Fourteen towns in the United States and one in Canada are named for him. Mountains in Antarctica, North and South America, Australia, New Zealand. An ocean current off of Peru, the largest glacier in Greenland. A bay, a county, a university, a redwood forest in California. Streams, parks, city streets, even a "sea" on the moon carry his name. The map of Northern Nevada is covered with Humboldts name; the county, a town, a canyon, a mountain range, a huge national forest. Most of the California and Nevada naming was due to the little "Pathfinder". John C. Fremont. Fremont was an ardent Humboldt admirer, naming the river that marked the westward expansion and later the gold rush trail. Fremont's diary- Nov. 8th, 1845. " Crane's Branch led into a larger stream that was one of the two forks forming a river to which I gave the name of Humboldt. I am given by Himself the honor of being the first to place his great name on the map of the continent. Both the river and mountain to which I gave his name are conspicuous; the river stretching across the Basin to the foot of the Sierra Nevada." Ok, Ok... it looks like I know way too much about Humboldt. I put together a display for the Reno Show a few years ago... this is just some of that material. 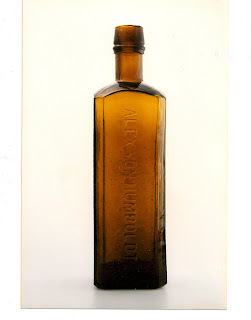 I always loved the photos of the Alex von Humboldts Stomach Bitters bottle in Wilson's Western Bitters. 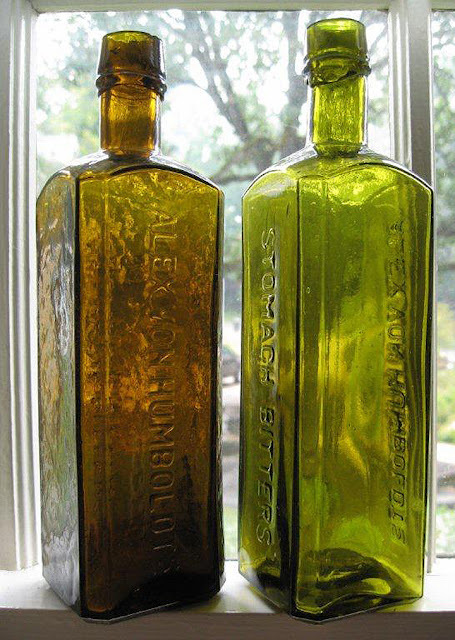 The two bottles, one plain-jane, the other whittled, crooked, crude.. the epitome of what we want in a western bitters. If there was a picture that I went back to over and over and helped to form my fascination with Western Bitters, that's it. I thought I knew I little about the bottles when I put together that display. Warren F.'s research will change much of the previous written information about the manufacturers, even the date of distribution. I thought for sure the beginning had to be 1869, the hundred year centenary of Humboldts birth. Nope! Wilson had one thing right about Alex von Humboldt; he "isolated the deadly native poison 'curare'." That he did, but it's kinda like condensing Abe Lincoln's accomplishments down to "being tall". 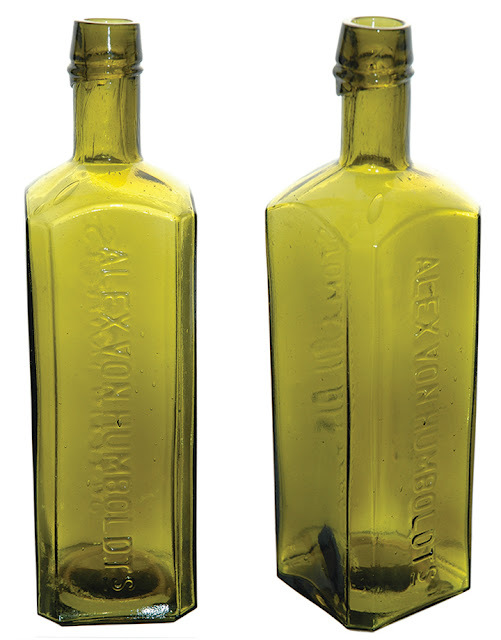 So, if your not buying the "Historical of the West" thing... don't confuse our bottle with the lame looking Eastern aqua bitters. Our ALEX VON HUMBOLDTS / STOMACH BITTERS was blown in San Francisco. Well done Roger - Well done! Yes, has anyone seen the pure green example just dug by chucky-cheese ? Are you talking about the olive-amber example that Chuck Erickson has? Chatter on the raido is that Chucker dug a wicked green example with light shoulders and amber striations, possible best known example. 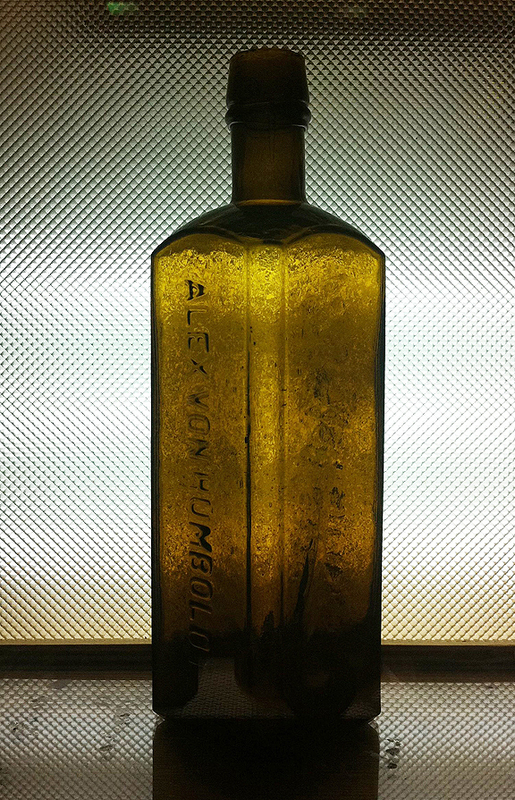 A digger in far Northern California dug 4 examples of this bitters, with one example being black glass. Incredible, that would have to be the best bitters hole of the past decade. Not sure who dug it, but congratulations. Is this new black glass example the only one known ? It's the only example I've heard of. Were these examples just dug in the last few months?